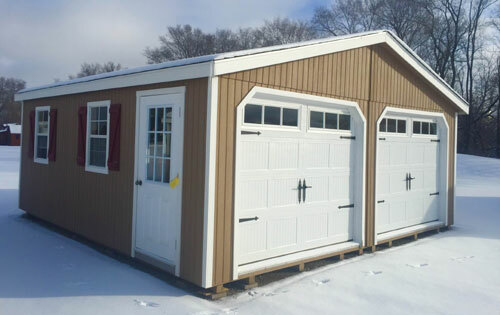 This garage is delivered assembled in two pieces and then we fasten them together. Made with great quality materials and labor. This is where you come in, you pick the color, size, door options and window placement. The building shown in the pictures is standard. Standard features are pressure treated plywood floors and 12″oc joist. 16″ oc construction, architectural shingles, 4-24″x36″windows with shutters, 36″ service door and homestead garage doors, painted to your color choice. A 20′ x 20′ is shown, other popular sizes are 24′ x 24′ and 20′ x 24′.